Today, Father Basil and I went for a drive to Saint Paul’s Abbey in Newton, New Jersey. A very splendid day away visiting some of his former confreres (Fr. Basil was a monk of St. Paul’s before transferring his stability to St. Mary’s Abbey, Morristown). The Prior of Saint Paul’s, Father Samuel, received us most graciously; we joined the monks for Mid-Day prayer and lunch. Father Basil and I spent time visiting the abbey’s cemetery. It was a delight to visit a venerable abbey such as Saint Paul’s because of its monastic witness and because of its missionary work. This abbey belongs to the Saint Ottilien Congregation of monks which is a missionary congregation. consecrated religious (being a sister, a nun or a priest) this summer. The Anchoress made a similar report on August 18; visit her blog for more info. Here is a sampling of those who took vows, promises or were invested with the habit in last calendar year. 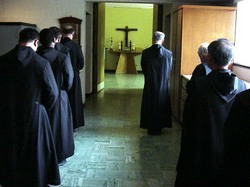 St. Benedict’s Abbey: 1 professed simple vows; 1 professed solemn vows; 1 clothed in the habit. 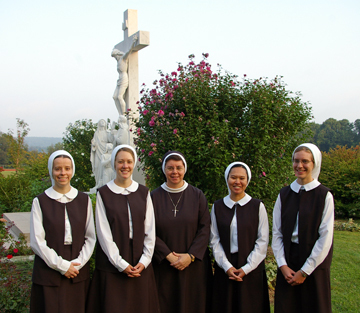 A NEW congregation: Maronite Servants of Christ the Light: 1 sister and many more to come! Source: Mother Teresa, Heart of Joy: The Transforming Power of Self-Giving, Servant Books, 1987. Reading this article on vocations made terrific sense and corresponds to what I’ve been thinking about for some time. It is clear to me now there are some things are necessary for verifying a vocation to a religious community (diocese?) without which it would be difficult for me to see how one can fulfill the destiny God has planned. 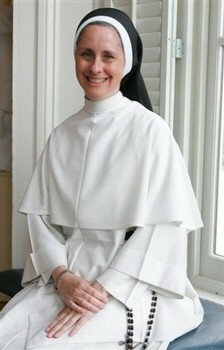 That is to say, if a vocation candidate does not see in a particular order just what Sister Catherine says below, namely, that there needs to be an evident sense of tangible joy, youthful zeal for the Kingdom of God, a realization that God has a plan, and fearless love then one does not have a vocation to that charism (religious order). Ask the question: What is the long history of faithfulness of this group that I am looking into? Is it faithful to the papal magisterium or not? Let me also say that Sister Catherine is right when she points out that the job of the vocation director is not to make a sales pitch (yuck!!! how repugnant to think that a vocation director is making a pitch to join a community, but it is true) but to expose the vocation seeker to the beauty of serving God and the beauty of that particular charism in the Church. If you are being recruited, run away fast!!! So, the beauty of the life lived alone and with others, the beauty of the liturgical life according to the mind of the Church (and not some trendy, self-serving liturgist or superior) and personal prayer, the beauty of the particular observance and the religious habit, the beauty of the service rendered to the Church…is what will lead others to this form of consecrated life. The 1970s, 1980s, and 1990s are over; they have not borne much fruit; the Church wants priests and sisters who are joyful and faithful to the Lord and the sacrament of the Church. It is time to go to the sources, to live according the Gospel and the way the founders wanted without romanticizing the life… Sorry, Sister has the right way of proceeding. NASHVILLE, Tennessee, JULY 27, 2008 (Zenit.org).- There are three high priorities in fostering vocations to the religious and priestly life, said a Dominican sister with 15 years of experience in vocational work. Nashville where the Dominican Sisters of St. Cecilia own and operate Overbrook School, St. Cecilia Academy and Aquinas College. Recently named a member of the U.S. bishops’ national advisory council, Sister Hopkins suggests the three highest priorities in fostering vocations: education, sacramental devotion and youth ministry that exposes young people to both prayer and evangelization. ZENIT spoke with Sister Hopkins about supporting young women who are discerning a vocation to the consecrated life, and about how she discovered her own call. Q: You worked for 15 years as vocation director for your order. What was the key to finding your own vocation? Did your own experience help you to aid other women in discerning theirs? Sister Hopkins: The key to finding my own vocation was the realization that God had the plan and I just needed to discover exactly what that plan was. It began with inner turmoil at the thought that God could ask such a thing of me, but I very quickly found out that if he were calling, everything that I needed in order to respond would be provided by him as well. That brought me tremendous freedom and my turmoil was replaced by a very strong attraction. I was 24 years old and very happy, but not at peace since I couldn’t say for sure what God’s will was for my life. All I knew with certainty was that daily Mass had made me hunger for more, and so I went in search of where I could best root a growing desire to give of myself. I finally investigated religious life so that I could rule it out and marry with a clear conscience. When I actually visited our community and saw very tangible joy, youthful zeal and a long history of fidelity, fear was reduced by a newly formed conviction that this is what God had created me to do. I would say that my own experience made me sensitive as a vocation director to the fact that successful discernment takes place apart from any pressure and within the challenging silence of prayer. When I looked for God’s will, I sought advice and asked lots of questions, but I wanted to make a decision that, while informed, drew strength from an interior conviction that I recognized as coming from God. The Dominican Sisters in Nashville understood that it wasn’t a matter of recruitment but of exposure. As a vocation director, I made it a point always to respect the delicate interior struggle through which most people must pass. My job was not to make a good sales pitch, but to convey the beauty of our life and to expose young women to it through a visit or retreat experience. I had to help those who had the inclination, but struggled with uncertainty, realize that the simultaneous fear and attraction they felt was normal; and that a sense of unworthiness is not a bad thing since really none of us is “worthy” of divine espousal! Making the choice entails a movement away from a career mentality to the realization that religious life is about giving yourself to a love that is without limit. Q: You have three brothers that arepriests. Do you think there is a different strategy for discerning and fostering the vocation of young women than for young men? In what ways? Sister Hopkins: My experience has been that, in general, men take a lot longer in the discernment process, whether it regards marriage or religious life. Once a woman has “conviction” she is usually impatient to begin a process. I wonder if men tend to intellectualize it in the beginning, whereas most women religious begin intuitively and very privately. They may struggle longer before admitting they are considering the idea, but once they discern, it is very much a matter of the heart and they are propelled past fears and natural ties to offer that gift of self without reserve. Men need to balance their discernment with devotion and women need to consciously anchor the process with an intellectual understanding of the call. In guiding women in discernment, the idea of espousal is a considerable attraction since we are all programmed by our feminine nature to love and to nurture in a unique way. I had aspirations of a big family and came to understand that God wasn’t asking me to deny that desire but to expand it! Both men and women need to know that a desire to enter into the married state is not only good, but is even necessary if one is considering religious life. The absence of such natural desire may signal a problem of selfishness or difficulty in giving or receiving love. Such an emotional handicap would make happiness in the religious life impossible. Regarding my brothers, each of them was different in his discernment. A discussion about them is a real study in temperaments. I used to hold them up as examples to illustrate that there is no “one type” that God calls, but that each of us with our unique characters can contribute in unique ways. And yes, my brothers are “unique characters.” We weren’t born religious and occasionally have to remind people that we were in the mainstream in our youth and that none of us was voted “Most likely to become a religious” in high school. There is hope in that fact. Q: There are certain orders of both men and women religious — including your own — that have enjoyed tremendous growth in the last decades. What do you see at the key to this growth? Sister Hopkins: I believe the key to growth in vocations is found in the witness of joyfully living an ideal that is single-hearted, Eucharistic, faithful to the Church and her teachings. It is lived in the vibrancy of community life while rooted in prayer. That was what I experienced with the Dominican Sisters in Nashville. I believe that young people today are as idealistic as they always have been and they are looking for a way to channel their zeal and to find support in a desire to grow in holiness. I do not think it is fancy programs or complicated spiritualities that attract, but rather simple fidelity. There are movements of the Holy Spirit lighting fires in many directions today that are picking up significant momentum and should fill us with hope. 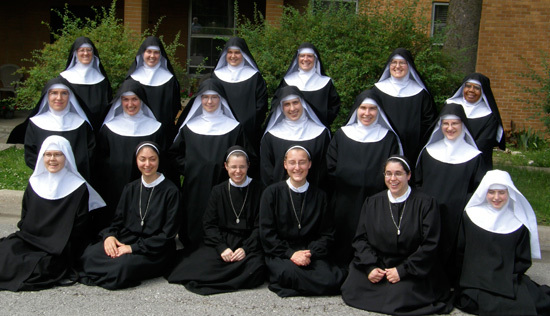 The Council of Major Superiors of Women Religious is an organization of religious communities who are committed to living the essentials of religious life and are supportive of one another. I would recommend that young women exploring a religious vocation visit the CMSWR Web site to see the many communities which are growing today, in spite of reports to the contrary. Q: There is much talk of the vocations crisis and whether or not it is nearing an end for priestly vocations. 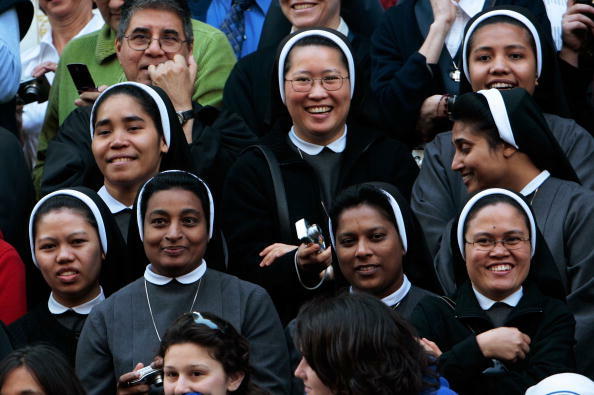 How about vocations for women religious? Is the crisis nearing the end? Sister Hopkins: Women religious have been the backbone of social service, education and health care in this country. The drop in the number of women entering religious life has impacted these fields and it will take many years to see a significant return. I am reminded, however that the Holy Spirit is not limited by Gallup Polls or the predictions of sociological studies. Consider the simplicity and tenacity of Blessed Teresa of Calcutta at a time when the numbers of women religious were declining. 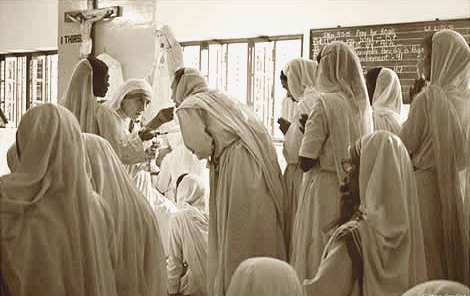 Her response to God’s call yielded a new religious order that grew to over 4,000 sisters, an associated brotherhood of 300 members, and over 100,000 lay volunteers, operating 610 missions in 123 countries. 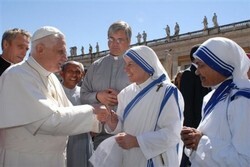 What our world needs is more Mother Teresas, people with zeal, humility and a fearless love. Over the past 20 years I have seen the numbers of women inquiring into the religious life grow both in numbers, quality and openness. Given the fact that our culture is not supportive of such ideas, nothing short of grace can explain it. Q: You were recently named to the U.S. bishops’ national advisory council. On the heels of Benedict XVI’s visit to the United States, what do you see as the priorities for fostering vocations in the States? Sister Hopkins: I think that in order to foster vocations to the priesthood and religious life the three highest priorities should be in the areas of education, sacramental devotion and youth ministry that exposes young people to both prayer and evangelization. Young people are hungry to learn the faith and quickly recognize the unreasonableness of relativism. They have a natural desire to “know” God and will be more likely to devote themselves to a life dedicated to him if they have been educated in the faith. I think that this generation is quick to identify the need for such an apostolic focus since the lack of it has produced such confusion and suffering. It is important that the Church continues to strengthen Catholic education that is focused, faithful and rooted in excellence. Devotion to the sacraments is key to discovering as well as nurturing a vocation. When young people benefit from regular reception of the Eucharist, confession and begin to develop a prayer life, then God’s call has a chance of being heard. Eucharistic adoration is drawing many vocations to the priesthood and religious life, a fact which makes sense if you consider that such time spent in God’s presence brings light and warmth to our souls. There is a movement of the Holy Spirit in progress that increases in intensity whenever youth affectively influence one another. There is nothing more powerful than the witness of young people striving to know and do God’s will. Love is not meant to be contained, and so when we discover the Person of Christ, it is natural to experience an interior compulsion to share that discovery with others. Substantial youth ministry which prompts conversion, devotion and exposure to positive peer influences has been successfully producing vocations to the priesthood and religious life. Of course, it is important for young people to be exposed to priests and religious who are joyfully and faithfully living that commitment. 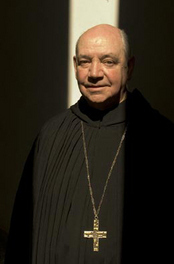 Today, the Abbey of 47 monks is led by Abbot Giles P. Hayes, OSB; he’s the tenth abbot, elected the monks in solemn vows on March 8, 2006. Monks do a wide range of things. Their first obligation is the monastic life as it is laid down by the Rule of Saint Benedict, the Constitutions of the American-Cassinese Congregation and the various customs of the house. So, the life is situated around prayer, personal and communal. The personal side of a monk’s prayer life is determined individually (hence the use of “personal”) and typically includes lectio divina, the rosary, Eucharistic adoration and spiritual reading. While it is not true that all of the monks do all of these pious acts all of the time, many are faithful to many of the practices on a daily basis. Lectio divina is clearly the most important prayer that a monk has to be faithful to or else his monastic life suffers.